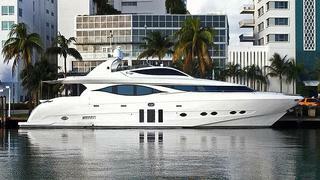 Bob Anslow at International Yacht Collection sends news that he's signed the 27.4m motor yacht Mia for sale. Custom-built by Eagle to RINA class and MCA compliant in 2009, she was fully refitted including a total repaint in 2011. An interior by Luiz de Basto accommodates up to nine guests in a master suite, VIP stateroom, a triple and a double cabin. Twin 1550hp MAN engines give Mia a cruising speed of 21 knots. Located in Fort Lauderdale, Mia is asking $2.3 million.